Espen Jorstad is chipping up quite nicely since the start of the day. 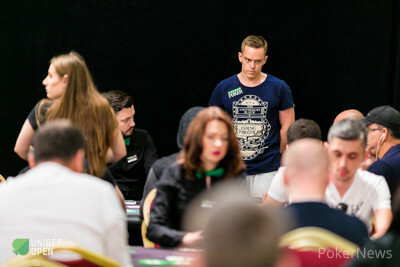 Jorstad just added some more to his stack after three-betting preflop. Elhanan Togerman raised from the under the gun position to 1,600 and the player to his left, Adrian Barbu, called. When it folded around to Jorstad in the small blind he didn’t grab calling chips. Instead, he three-bet to 7,000. Togerman was quick with the fold but Barbu couldn’t let go of his hand as easily as Togerman did. Barbu did end up folding his hand while shaking his head. Jorstad collected the pot and could start stacking again.